A Stanford University team has calculated exactly how Canada can move away from fossil fuels, transitioning 100 per cent to clean-energy through existing technologies. But just how fast we get there is up for debate. An environmental research team from the prestigious Stanford University in California has calculated exactly how Canada can move away from fossil fuels, transitioning to a totally clean-energy future through existing technologies. But the assertion that this transition is just over a decade away is the source of hot debate. The Solutions Project has evaluated the wind, water and solar (WWS) potential for all 50 U.S. states and 139 countries around the world, including Canada, providing data on the costs and benefits for each nation. 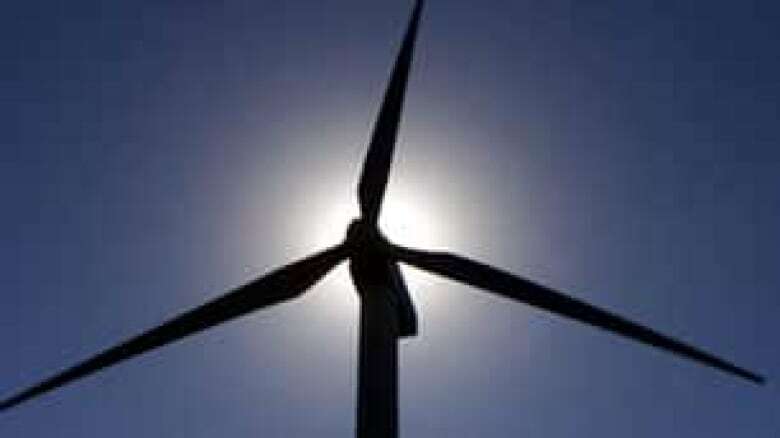 The goal of the group — which is backed by Hollywood heavyweights Mark Ruffalo and Leonardo DiCaprio — is to ultimately move the world toward 100-per-cent renewable energy use. "That would power Canada for all purposes," says Mark Jacobson, a co-founder of the Solutions Project and a civil and environmental engineering professor at Stanford University, in the heart of Silicon Valley. "I feel we know it's technically and economically possible to transition the energy infrastructure, which is built primarily on fossil fuels and nuclear power, to entirely clean, reliable and safe renewable energy," he says. "In all sectors — electricity, transportation, heating and cooling, agriculture, forestry and fishing — we can transition all those sectors to clean, renewable energy at reasonable cost and make it reliable and make it secure for generations to come." 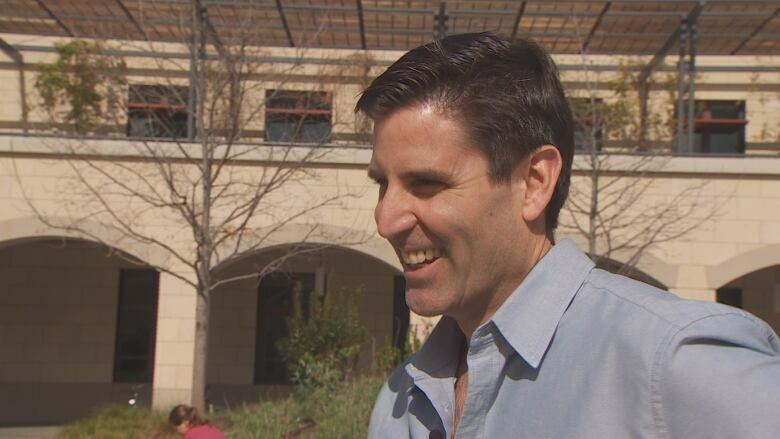 While Jacobson and the Solutions Project believe that 80 per cent of all energy will be renewable by 2030, there are some, like Stanford business professor Tony Seba, who say this could happen even faster. 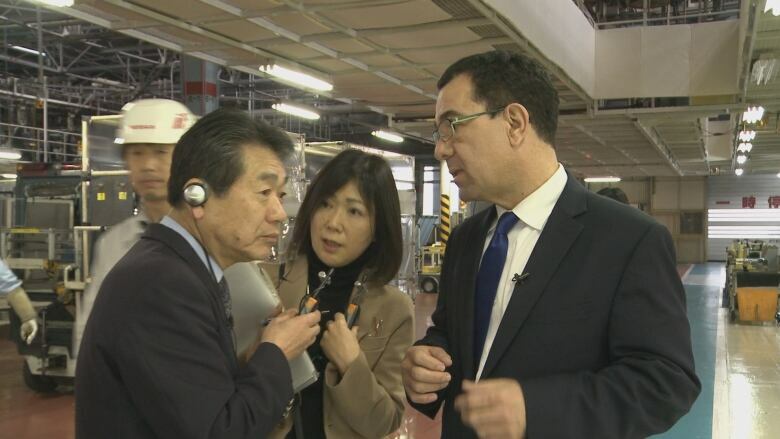 Seba, whose advice has been sought in boardrooms from Tokyo to Paris, is confident that solar and wind are key to sweeping away the industrial age of transportation and energy — and fast. He suggests we can reach that magic number of 100 per cent within 15 years. 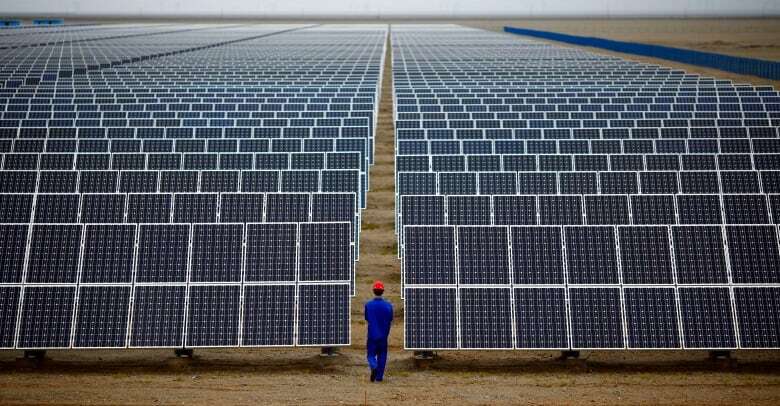 "The solar-installed capacity has doubled every two years since the year 2000. Doubled every two years," he says. "If you keep doubling that capacity, all you need is seven more doublings in order for solar to be 100 per cent of the world's energy supply." Seba — also author of Clean Disruption of Energy and Transportation — points to the demise of Kodak in 2012 to illustrate what he sees as an impending market disruption in the energy sector. In the blink of an eye, Kodak, the world's top film-photography company, was forced into bankruptcy by advances in digital photography and photo-sharing. Seba cites bankruptcies in in the coal industry as the "start of the end" for the non-renewable energy sector. According to Bloomberg Business, five major U.S. coal companies have filed for bankruptcy over the last two years. What's more, the low cost of oil has not slowed investment in clean energy: $367 billion US was invested in green energy in 2015, the Solutions Project says, compared to $253 billion US for fossil fuels. Silicon Valley, home to two of the world's most-valuable companies, Apple and Google, is making the case that software engineers and venture capitalists, the people who ushered in the digital revolution, are on the verge of another breakthrough — this time in energy. The suggestion is that the combination of falling prices for solar power, energy storage and electric vehicles will create serious challenges for fossil-fuel companies in the coming years. "There's going to be a moment over the next five years where electric cars will be cheaper than the gasoline cars," says Seba. "But, also, it's going to be 10 times cheaper to charge on a per kilometre basis, and it's also 10 to 100 times cheaper to maintain because the electric vehicle has one per cent of the moving parts." At this point, 20 U.S. states have reached what economists call "grid parity" for solar power: the point at which solar energy costs no more than fossil fuels. Energy research company GTM estimates 42 states will reach that point by 2020. Meanwhile, the cost of wind power has fallen 61 per cent since 2009 and is still falling. "No oil. No gas. No coal. And nuclear would be retired. 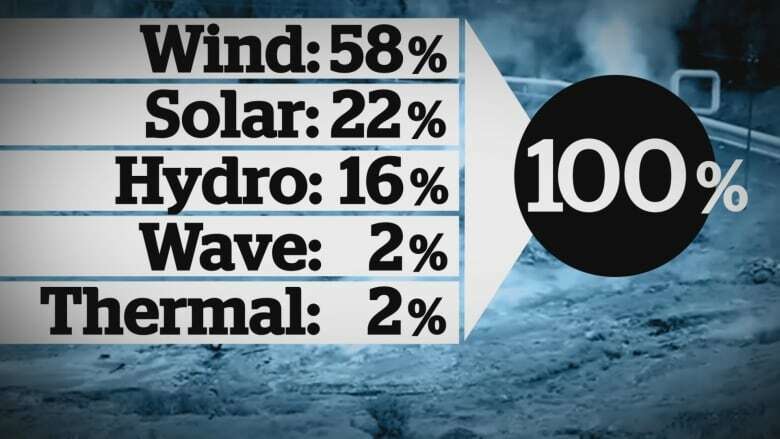 It's all wind, water and solar powering Canada, 100 per cent," says Jacobson. Such an energy mix would, according to the Solutions Project, lead to a long list of benefits, including the creation of 200,000 additional jobs in the energy sector. That calculation includes 500,000 fossil fuel-related jobs in Canada being transitioned to clean energy. The group also claims air pollution from burning fossil fuels would be eliminated, saving Canada more than $100 billion every year; energy prices would stabilize; and Canada would be able to reach the target recently set at the Paris climate change summit. While Silicon Valley is home to many who believe the transition away from fossil fuels will be quick, there are dissenting voices — even among those pushing for the transition. "The evolution is gradual," says Denis Giorno, president and CEO of Total New Energies, a spin-off company of French energy giant Total, the world's fourth-largest fossil fuels company. "I cannot see a transition where all of a sudden, in 2030, oil won't be necessary." Though Total is investing in solar power and other renewables, the Silicon Valley-based Giorno questions the ambitious timeline of a possible energy revolution. "This is a view we do not share at all," he says. "If you look at how much energy we need, and look at the energy metrics of the world, globally, we will still consume, in the best case in 2030, 70 per cent of [our energy] from fossil fuels." Jacobson believes estimates from oil companies are just plain wrong, and he maintains it is technically possible to transition to 100-per-cent clean energy by 2030. But he admits the transition will likely take longer "because of political and social reasons." Still, he's betting on an 80-per-cent transition within 15 years. Seba remains the most optimistic, arguing that innovations from Silicon Valley and high technology in particular will amount to a "clean disruption." His analysis is based purely on economics — and more specifically on falling energy prices. "Solar, electric vehicles, self-driving cars, storage for the home are technology-driven; they are going to be consumer-driven," he says. "Unsubsidized solar is going to be cheaper than subsidized fossil fuels. Unsubsidized electric vehicles are going to be cheaper than subsidized gas vehicles." "My advice for those people who are holding back and claiming their livelihoods are going to be hurt, well, their livelihoods are going to be hurt more if they don't transition," Seba says. Tracking that transition so far, the Solutions Project calculates that 70 per cent of all the net new electricity generation in the U.S. last year was from wind and solar; another 25 per cent came from natural gas. Meanwhile in Europe, Jacobson says if you look at the net gains minus losses, "100 per cent of new generation was from clean-energy sources." Most of the globe's coal, natural gas and oil investments will ultimately be affected by the transition, Seba suggest, at risk of becoming "stranded assets" — resources that lose their value before the expected end of their economic life. "They are going to be stranded over the next five to 15 years," he maintains. "It's not going to take us over 40 years."